An artist's impression of the shared campus. The Shared Campus will involve the construction of a new STEM centre on the Limavady High School site and a Sixth Form centre on the St Mary’s site. The project, first reported in the Derry Journal in January 2014, reached an advanced stage before Christmas . News the shared campus is finally going to be built has been welcomed by the principals of both schools. St. Mary’s Principal, Mary McCloskey, and Limavady High School Principal, Shane Laverty are “delighted to see the project, one which is the first of its kind in Northern Ireland, finally coming of age”. They say it will be “a huge boost for both schools, the local community and the wider Limavady district”. In a joint statement, both principals spoke of the “pioneering work in shared education between the two schools”, and which has been “recognised for what it is - at the forefront of providing the best possible educational outcomes for all of the young people who attend St Mary’s and the High School”. The two school principals thanked staff of both schools for their hard work and effort “as they helped to bring about this significant development”. “We have worked tirelessly for the past three years with our colleagues in the EA Western region and CCMS to see the Shared Campus become a reality,” their statement said. “Long hours have been spent in consultation, and in the fine-tuning of this project, which is widely recognised as being at the forefront of Shared Education. In all, six new schools are to built with money provided under the Stormont House and Fresh Start agreements. The funding, totalling £43m, will allow shared education campuses to be built in Moy, Limavady and Ballycastle. The funding will also allow a new build for Roe Valley Integrated Primary School. 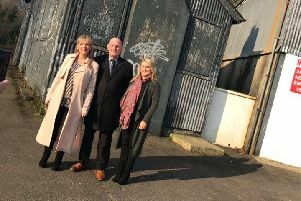 Sinn Féin MLA Cathal Ó hOisín welcomed theannouncement as “great news for the entire community”, and added it would mean improved facilities for pupils, teachers and parents alike”.